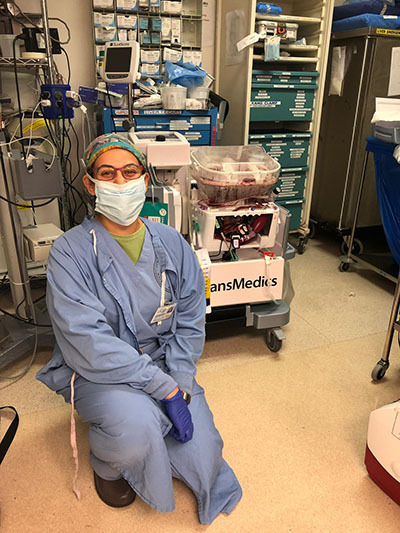 Description: Our liver transplant anesthesia fellows work with an outstanding team of liver transplant anesthesiologists and surgeons at one of the busiest transplant centers in the country. Our anesthesia team consists of 14 faculty trained in liver transplant anesthesia and critical care. We perform close to 200 liver transplants per year, including 20-30 living donor transplants and 8-10 pediatric transplants. Patients are often acutely ill, with high MELD scores at time of transplant. In this unique non-ACGME fellowship, trainees split their time between working as the liver transplant anesthesia fellow and serving on faculty as an attending clinical instructor in the general OR (average 2 days/week in the main OR) and have the opportunity to work overtime hours in the general OR for additional pay. Our fellows participate in adult and pediatric cadaveric and living donor liver transplants, as well as transplant selection committee meetings, transplant morbidity and mortality conference, and journal club. Fellows are expected to participate in at least one scholarly project during the year. There are several ongoing research, education, and quality improvement projects to which fellows may wish to contribute. The fellowship prepares candidates for leadership positions in transplant centers and fulfills criteria required to become Director of Liver Transplant Anesthesia as put forward by the ASA. Clinical responsibilities: On designated fellowship days, the fellow will be on call for liver transplants occurring day or night. Fellows will only take call until 7pm on evenings preceding an attending clinical instructor day. Fellows will take an average of two weekends per month of home call. Fellows will participate in 60-80 liver transplants during their fellowship year. Designated attending days will be spent providing anesthesia services for a wide range of cases in the general OR, either working alone or supervising residents and/or CRNAs. Research opportunities: During the fellowship year there is ample opportunity to participate in transplant research. Our group is currently conducting several large database projects and multiple randomized controlled trials. Our fellows are encouraged to attend and present at a liver transplant conference, such as the ILTS. Application: Requires CV, statement of interest (limit 500 words), and 2-3 letters of recommendation. Letter writers should email their recommendations directly to Dr. Sonali Joshi. Please contact Dr. Sonali Joshi, Fellowship Director, with questions.